Olivia Folino Gallo took part in the World's Greatest Shave on 14 March 2018 for the Leukaemia Foundation. She was hoping to raise $2000 before then which will assist Australian families facing blood cancer the emotional and practical support they need. Blood cancer claims more lives than breast cancer or melanoma. And today another 35 people will be given the devastating news they have leukaemia, lymphoma, myeloma or another blood disorder. Olivia’s CAS experience raised over $1500 which is a remarkable achievement as $53 alone ensured someone being treated in hospital got a personal visit from a highly-trained health professional so they get the extra support they need. Chanelle Caires spent several weeks organising a Beach Clean Up for one of her CAS experiences last Term. This event took place on Clean Up Australia Day on Friday 2nd of March at North Wollongong Beach. It was a successful afternoon with Stage 4 and 5 students collecting more than 4 woven garbage bags full of waste that would have ended up in our ocean and local swimming spots. The plastic waste collected will be recycled by Stage 4 students and recreated into plastic sculptures for their Sustainable Change Visual Arts Unit. It is wonderful to see our Year 11 students already taking on such beneficial CAS experiences and directly relating these to Global Issues on a local scale, Chanelle is to be commended on organising such a fantastic event. "It was obvious that the students were surprised as to how much garbage was found and proud of themselves for collecting a considerable amount. It was extremely rewarding to see the students having fun whilst involved in the activity and also to see the immense amount of waste removed off our shores. Christy was very busy last term organising two First Aid courses through NSW TAFE for one of her CAS experiences. The first one took place at Elonera at the end of Week 10, which involved IB students and some of our teachers staying back after school from 3.15 - 7.15pm on Thursday 5th and Friday 6th April. This has been a wonderful opportunity for our students to complete certified First Aid, asthma and anaphylactic training. These skills could potentially one day save a life. I would like to thank Christy for all of her hard work in organising these events, it has been very much appreciated. The second course took place during the last week of term 1 for EMS staff. Last term one of our Year 11 students Heather, entered the Cambridge Immerse 2018 Essay competition in Philosophy as a CAS experience. I have just been informed that Heather won this competition!! The Cambridge Immerse Global Leadership Programme is a unique one week multidisciplinary academic summer course designed by leading experts at the UK’s top universities including the University of Cambridge. Heather will be introduced to a variety of different disciplines allowing scope for discussion and debate during this leadership summer course. She will develop the leadership skills whilst forming her own opinions about the world around her. The expert academic team at Cambridge have designed this leadership programme which imparts both specialist knowledge and theoretical frameworks, equipping participants with the skills needed to succeed in future leadership roles. The Global Leadership summer course will provide future leaders with an unparalleled insight into the global social, political, and economic issues that the modern world is faced with. Heather will learn to analyse and assess current affairs and global challenges through the lens of a variety of disciplines: modern political theory, international relations, philosophy, economics, and geography. I would like to congratulate Heather on this outstanding achievement and wish her all the very best for the upcoming Cambridge Global Leadership Programme that is set to take place from 1st - 7th July this year. The Young Endeavour Youth Scheme is a not for profit organisation which provides young Australians with a unique, challenging and inspirational experience at sea. The voyages increase self awareness, develop teamwork and leadership skills and create a strong sense of community responsibility amongst members of the youth crew. The Scheme began when the magnificent sail training ship STS Young Endeavour was given to the people of Australia by the United Kingdom as a Bicentennial gift back in 1988. Since then, the Scheme, in partnership with the Australian Government and the Royal Australian Navy, has provided challenging training voyages for over 12,000 young Australians aboard Young Endeavour. Young Endeavour undertakes around 20 voyages each year, mostly along the east and south coasts of Australia. Each voyage we embark 24 young Australians - the youth crew - and nine specially trained Royal Australian Navy crew, usually for an eleven day adventure at sea. Heather has recently found out that her application to set sail on the Young Endeavour later this year as part of her CAS has been accepted and we wish her the experience of a lifetime with this journey!! During Week 4 lasty Term our Year 11 Psychology class took part in a morning tea with the thinkers. Pavlov, Loftus, Ainsworth and Milgram were all in attendance. Great knowledge of the thinkers and interesting conversations were shared by all. Thank you Alex for putting on such a wonderful event for these students. Year 11 and 12 Visual Art students took part in a photoshoot at Belmore Basin last term during Week 6 for Visual Arts, which was designed to develop their practical skills in digital photography and allow students to establish their own contexts, conceptual development and intentions in their art-making practice. This excursion enhanced students regular classroom experience currently based on identities and relationships of human beings with their valued possessions in a global world, some of these images have been edited to produce final images for this unit. 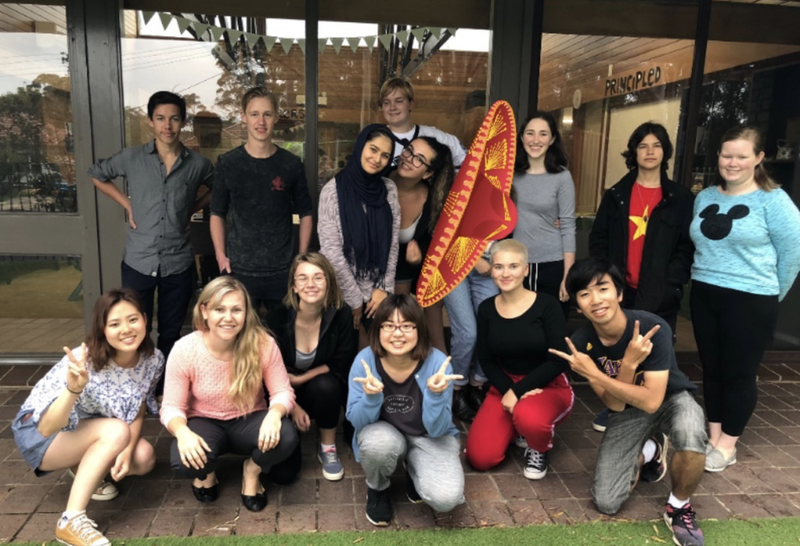 Our IB students were in for a treat on Harmony Day this year with Japanese University exchange students running afternoon workshops teaching DP students how to write their names in calligraphy and playing one of their favourite sports dodgeball. An enjoyable afternoon was had by all concluding with the whole school Harmony Day celebration in the hall where our IB students hung their harmony reflections written on ivy leaves. It was nice to see the IB mission statement in action where students promoted a better and more peaceful world living in harmony with each other.